1 x Plate for Cigarette Tobacco Rolling Papers. Detail Image. Size: approx. 18 x 14 x 1.5 cm. We will try our best to reduce the risk of the custom duties. the actual color of the item. 25 Booklets Of Rizla Silver Ultra Thin Tabacco Rolling papers. YOU GET 25 Booklets = 1250 Leaves. Translucent slim 110mm rolling paper, burns smooth. Less processed and vegan, these cigarette cones are the perfect way to enjoy your smokes. The cone shape lets more tobacco burn at the beginning, and then less and less tobacco is burned with each puff. Natural Unrefined Classic Pure Hemp. HULLS ONLY. A NICE STARTER SELECTION FOR YOUR COLLECTION. SCAN GIVES ACCURATE REFLECTION OF CONDITION. 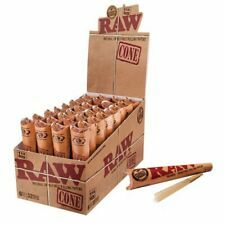 RAW Classic 1¼ Cones have revolutionized the smoking industry! That’s no exaggeration – they’re as easy as it gets! We are proud to say that unlike others, genuine RAW Rolling Papers have no added chalk or dyes! A great way to roll up your favorite herbal smoke. A special rice/hemp blend that creates an easy smooth burn. 36 Blueberry Flavored 1 1/4 Pre-Rolled Cones. 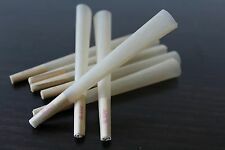 Each cone is a special blend between Rice and Hemp which creates an easy smooth burn. Zig-Zag Regular Red Rolling Paper - 100 (1 Box). Finest quality cigarette paper. At Onogo, we strive to move with the world and all of its advances. Toy, Children & Baby. 70mm - Regular size. We are here to help. Available in such a variety of flavors, you are sure to find what you’re looking for. By purchasing, you agree that you are 18 years or the age of majority in your community, whichever is greater. These papers look amazing and burn clean. Note: Due to the difference between different monitors, the picture may not reflect the actual color of the item. Item: Smoke Paper. Premium quality, noble hand-rolled paper. The RAW Backflip Bamboo Rolling Tray is another one of the latest products from the good people at RAW Rolling Papers. This is the perfect combination of look and function. The RAW Backflip Bamboo Rolling Tray has strong magnets that easily snap the two pieces together. You are buying 1 Raw Perfect Cone Maker. 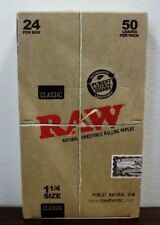 WE ARE AN AUTHORIZED RAW DEALER! 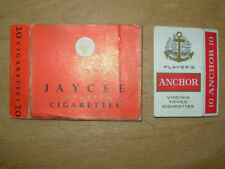 Bugler Cigarette Rolling Papers 24 Packs Booklets Box- 115 Leaves Per Pack New. Condition is New. Shipped with USPS First Class Package. Top doubles as a rolling tray. Large RAW Rolling Box with Magnetic closures. I'm always here to help you with anything you may need. May be of interest to a collector of tobacciana ! Nicely Displayed. In Fair Condition - With Age Wear & Staining. Rubbing & Paper Loss to Edges & Corners. SEE & STUDY PICTURES FOR A FAIR REPRESENTATION OF CONDITION. With its bold lettering and design, it Displays Beautifully. Here is your chance! Put your own artwork on these. Rubber Stamp them. 1 1/4 Size. You can take off pin in back and grind down and turn into a magnet or put a 3m sticker on the back and place anywhere. 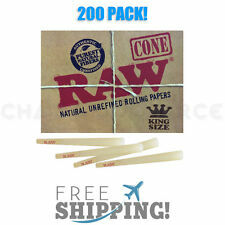 200 RAW Pre-Rolled King Size Classic Cones with Filter. AUTHORIZED RAW DISTRIBUTOR. NOT IN THE RAW BOX SHOWN.That is for display only. I'm always here to help you with anything you may need. Made with Styrofoam. Instructions - Remove bottom lid and fill box with cones. - Repeat until all cones are filled. - Push out the cones by replacing the bottom lid. 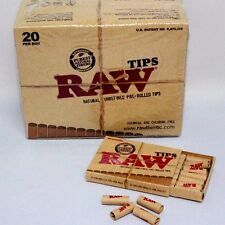 You are buying Raw Rolling Paper King Size Combo. 1x 110ml Rolling Machine. 1x Raw Lighter (Full Size). WE ARE AN AUTHORIZED RAW DEALER! Want to roll all six?. Just remove the plate entirely. Fill the holes with RAW King Size cones, add your favorite tobacco blend to the top, replace the lid and start tapping. You can finish them off by using the pin, which also doubles as a poker, and in about 45 seconds you have up to six perfectly smokable cones! Enjoy hand-rolled natural leaves for those looking for the best slow burning natural leaf on the planet. We are confident that you will find these natural leaves to be much better quality and much CLEANER than the common wrapping papers on the market. Fills 1, 2, 3 or 6 prerolled King size cones at once, quick and easy! Inspired by an old Spanish millstone, just loosen the center pin and dial the plate to the quantity you want to fill. Place the RAW Kingsize Cones in the open holes, add your materials, fasten the top & start whacking! Aleda ™ The Original One. What is aLeda™ ?. Aleda™ is a revolutionarynew transparent cigarette rolling paper made of100% natural regenerated cellulose film. Why are aLeda™ papers so popular?. Transparent Cigarette Rolling paper. THIS TRAY HAS BEEN DISCONTINUED. GET YOURS NOW BEFORE THEY ARE GONE. "RAWTHENTIC" 1 1/4 size SHREDDER CASE (Doubles as a rolling Papers Storage Case too!). Classic design as RAW does with all of their products! Works well to shred your tobacco leaf into a usable consistent form! New Flavor By High Hemp! They feature a new "Perfect Fold Technology" where each wrap is folded in the perfect place for easy rolling. Wet Cherry. Wild Honey. Gin & Juice. Apple Martini. Sealable Lid with Rubber Gasket. ZEN ROLLING TRAY BLACK w/ rubber seal. These Zen Rolling Trays are the perfect size and shape for rolling out your best smokes yet. Rolling trays hold all of your rolling supplies, keeping them all in one place and preventing any waste. Rolls 40 blunts/cigars. Includes 2 chicken and waffles, 2 wet mango, 4 maple syrup, 4 mango tango, 4 spanish fly, 4 goomba grape, 4 Blueberry bomb, 4 peach paradise, 4 bahama mama, 4 laid back, 4 original G.
Golden Wrap Rolling Papers COCONUT Flavor 20 Booklets. DBZ Gokuu Cloud Character Metal ROLLING TRAY * 4x8 inch * Free Shipping! Famous Celebrity Guy Character Ceramic ROLLING TRAY *6x7.5 inch * Free Shipping!